Search engine optimization is the key to getting your audience to discover your website and interact with your brand. But without proper optimization, you won’t get the visitors you’re looking for—or the traffic you’re expecting. Feel like your website isn’t delivering the best possible results? 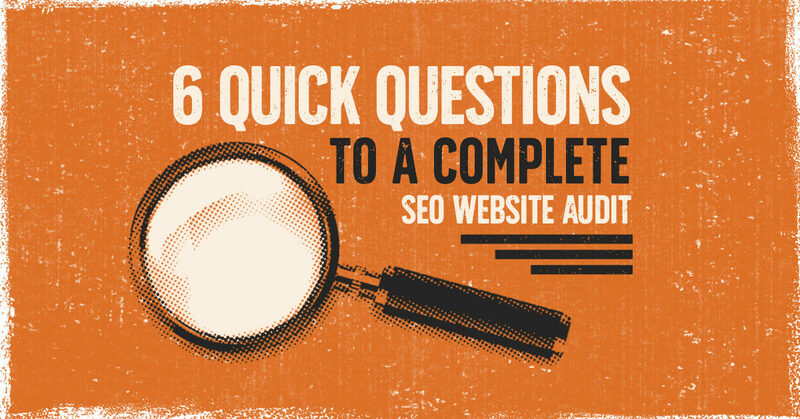 Ask yourself these questions to perform an easy SEO website audit. Are technical issues hurting your SEO performance? How long does it take your website to load? Don’t just guess. Use an online tool to measure load time. The faster, the better. One second or less is ideal; anything longer than three seconds needs to be fixed. Next, check to make sure that your website is mobile-friendly. Then look for other technical issues such as redirects, 404 errors, and duplicate content (especially in meta descriptions) that can cause Google to penalize your website. Also, check to make sure that all of your pages are being indexed in Google. Are you focusing on the wrong keywords? When adding new keywords to your list, one of the most common mistakes is trying to target “big” competitive keywords. If you do that, you can easily end up spending too much of your ad budget without seeing real results. A better strategy is to target long-tail keywords that you’re more likely to rank for. Do you know which keywords are winners or losers? Some of your keywords will outperform others. If you don’t track the performance of your keywords, you can’t tell which ones to keep and which ones to toss. Review the keywords you’re currently targeting, and separate the winners from the losers. Then focus your efforts on those keywords that are already winning. Is your competition ranking for these keywords? Researching your competitors can tell you whether a particular keyword offers a good opportunity for you—or whether it is too competitive. Try using the Moz toolbar to analyze your competitors’ domain authority and page authority. That can help you decide whether it’s worthwhile to go after a particular keyword. Is every page of your website optimized? How effective are your links? Link relevancy, link authority, and a diversity of back links are all critical to your SEO efforts. Depending on your particular strategy, you may want to focus on developing a good ratio of deep links versus homepage links. Also look at how many referring domains are linking to your website when compared to your competitors. The more relevant, high-quality back links you can get from unique domains, the better. This SEO checklist is only the beginning. There are a variety of other tasks and maintenance you can do regularly to increase website traffic. Work with an experienced partner to help your website rank better in Google search, get discovered online, bring in more traffic, and generate new leads for your business. Have questions about SEO or other optimization services? Contact our team of experts today.